E PRIMAVERA! FACEMU U IARDINU’ It’s Spring! Let’s Plant a Garden! I write a lot about my mother. We are lucky that she is with us. My father Carmelo, passed 13 years ago. Even though he is no longer physically with us he still touches our lives. He was first and foremost a family man, he loved his family, he loved his friends and he loved life. “Fari u iardinu” or planting a garden is a direct connection to our father, who approached growing food, like everything else in his life, with enthusiasm and joy. It’s Spring and we are ready to plant a garden! Picking something from the garden and using it in the house is a huge source of satisfaction. We enjoy a garden bouquet of flowers, herbs for our cooking, and fresh, seasonal vegetables. I inherited my father’s gardening gene. 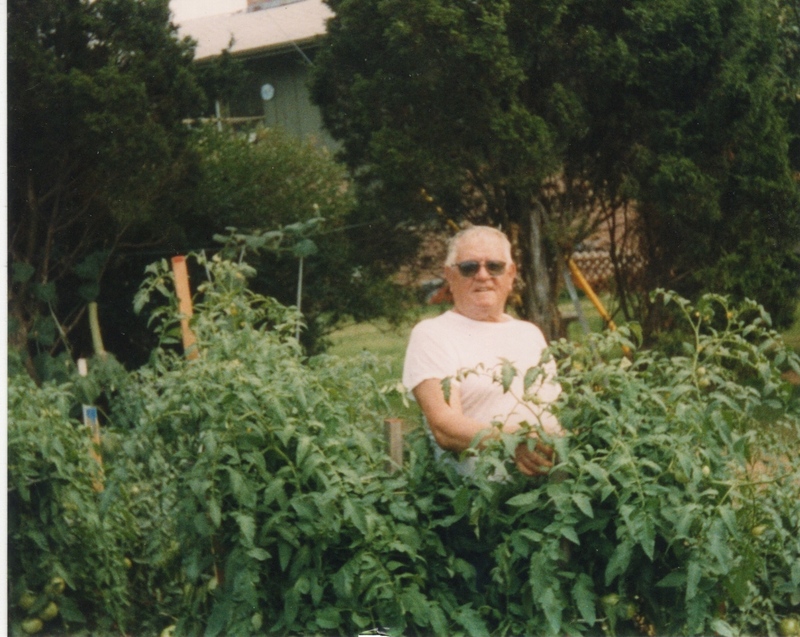 He loved a garden and he loved to garden. When he came home from a long day at work, he stopped to look at the garden before he came into the house. My father’s garden always produced beautiful vegetables. We used to laugh, because he did not believe in growing anything that was not edible. He replaced the hostas with onions and fennel and planted mint along the side of the house. He even tried to graft different apple varieties on the flowering crabapple tree. The wind and rain blew down his grafts, so the crabapple went and a cherry tree took its place. We had plums, pears and cherries. I learned to make plum jelly, how to can pears and make a cherry pie in ten minutes. My garden is not as big or elaborate as my Dad’s and I am not a great gardener. We live in Southern California so we can garden all year. Though, I admit that I am a springtime gardener and my enthusiasm wanes when it gets too hot. I plant everything, and my mother takes care of the garden. She waters, picks and does most of the weeding. I love pretty flowers, but like my father, I must have edibles in my garden. My strategy is to plant annual vegetables in my raised bed garden where I can do succession plantings without disturbing my perennial vegetables and herbs. In addition to my little vegetable patch, along the perimeter of my garden, where the perennial flowers live, I have planted Garlic, Parsley, Fennel, Mint, Onions and Tomatoes. So my garden design is Geranium alongside Garlic, Lily of the Nile next to Parsley, Mr. Lincoln Rose next to Wild Fennel. I try to garden organically and attempt to put the right plant in the right spot. We have the perfect spot next to the house for tomatoes. In fact, one of our tomato plants will not die. It lives between a rose bush and a Canna Lily. I planted it last spring. The plant has produced buckets of tomatoes all summer and winter and is still going strong. This year I trimmed the rose bush back and have added an heirloom tomato in that bed. I am working on adding color and variety to my garden while improving the soil. I have added several garden beds and I am in the process of creating a new raised bed for vegetables. We have the best weather for gardening but the tradeoff is that our soil is miserable. Digging a hole is a backbreaking task because our soil is compacted clay. Rather than killing myself trying to dig a garden, I use a method I saw in Better Homes and Gardens to create a new planting area. It takes time and patience, but it works and I have used this process for years. 2. Cover the newspaper with 2-3 inches of compost. I use a combination of composted manure and planter mix. 3. Allow time and weather to do their work. After several months the grass underneath the bed decomposes and 6 – 8 inches of topsoil are created. The process generally takes three months in my climate. So, I have a new raised bed “cooking.” We have fresh tender lettuce from the garden for salads, the finocchio (fennel) is almost ready for our St. Joseph pasta and my arugula seeds have sprouted. Yes! Let’s celebrate spring and plant something!